We are now more than halfway done with Fortnite season eight. That’s right, the week six challenges have arrived in this pirate-themed season. 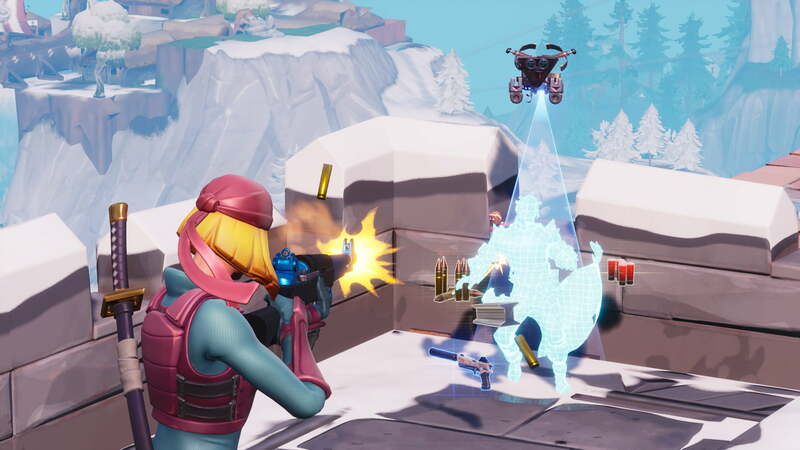 While this season’s challenges have been pretty tame the last few weeks, this week sees the return of the awesome challenges we’ve come to know and love with Battle Royale. One of those challenges is finding the five highest elevations on the island. We’re going to tell you where those locations are and how to get to them. We also put together a guide for visiting the wooden rabbit, stone pig, and metal llama, just in case you’re having a hard time completing that challenge too. Otherwise, let’s move onto finding the locations of the five highest elevations on the Fortnite map. Before we get to the highest points on the map, we have a few tips for you in doing this challenge. First, we recommend that you do this challenge in the Team Rumble mode. This reduces the number of enemies as well as gives you respawns so you don’t have to worry about dying and having to join another match. Next, we recommend that you find a group of friends to do this challenge with. You can turn on the Party Assist mode in the challenges tab of the home screen and it will allow your teammates’ progress to count towards your challenge, too. This is a great way to quickly visit all five of the highest elevations on the island. Lastly, you don’t need to visit all five of the locations in the same match so don’t worry about that. You can simply grab what you can, leave, and join a new match. 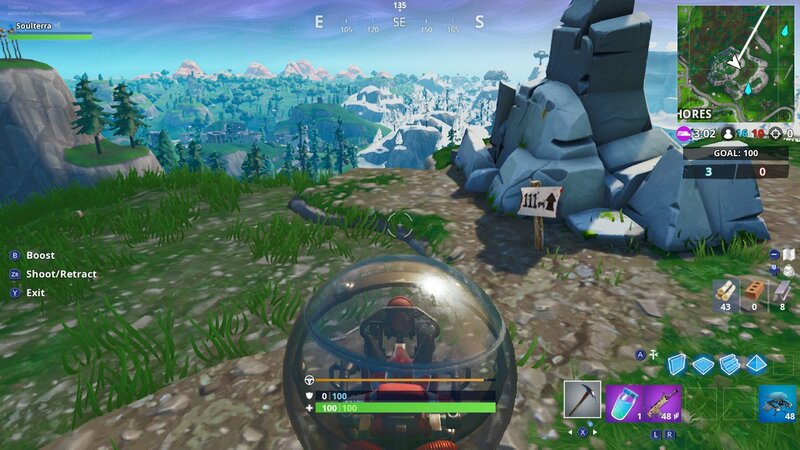 As for identifying the highest elevations in Fortnite, there are a couple of ways that you’ll know you’re in the right spot for this challenge. When you visit these locations, you’ll find a sign that notes how high the spot is. The game will also notify you when you’re in the right area. The first location that we are going to visit is also the highest point on the island. That location is the top of the volcano that was added with the start of season eight. It is an unnamed location but you can certainly see its huge presence on the main map. There are really only two ways to get up to this point of the volcano. You will need to either land on it or just the volcano’s vent to get up there. The point itself is on the southern side of the volcano’s summit. You will find the sign here that you need to visit. The volcano is 172 meters high. The second highest point on the island will take us to the western side of the map where we will spend the rest of the challenge. We need to head to the Polar Peak castle that was added with the start of the season seven map. It is fairly far from the volcano so you will likely have to do it in another game or, better yet, grab one of the new vehicles like the Baller. 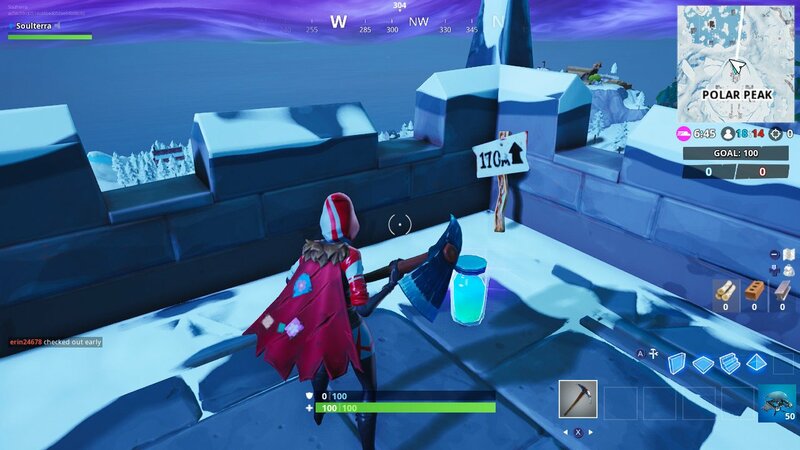 Once you reach the Polar Peak, you need to head to the highest tower in the castle of Polar Peak for the second highest point. Once you are on top of the tower, you’ll find this particular sign pointing west, noting that the Polar Peak is at a height of 170 meters — only slightly lower than the volcano’s highest point. Now it’s time to head to the third highest point on the Battle Royale map. This one is just slightly southwest of the Polar Peak point. 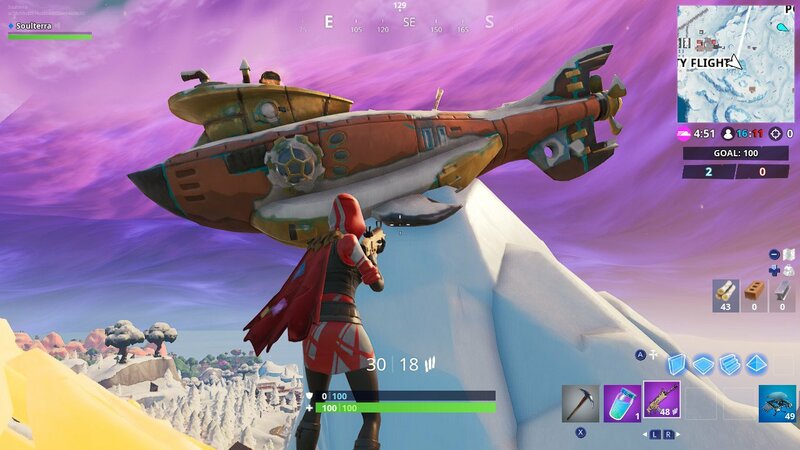 Head to Frosty Flights and just east of that is a very thin and hard to reach ice peak that has a submarine stuck at the top of it. This is the second hardest point to reach. This is because the ice peak is so thin and narrow and you can’t just run up it. You will need to land here at the start of a match, use the Baller vehicle, or build yourself up there. We used some good old fashion building to get up there but even that is difficult due to how the peak is shaped. Thankfully, you don’t need to get on top of the submarine itself for this one to count. The sign will note that this peak is at a height of only 130 meters. Fortunately, the last two locations are right next to each other and, oddly enough, the same height. If you are coming from the previous two locations, you will need to head north towards Snobby Shores. We need to reach the mountain that is located slightly northeast of Snobby Shores and directly north of the Viking village. If you happened to grab yourself a Baller vehicle then this will be super easy to do. You will just need to grapple and boost your way up the mountain to the top. Otherwise, you will need to build a ramp up to the top of the mountain. Once you get up here, you should get a notification that you have completed another part of the challenge. The sign up here notes that this mountain is at a height of 111 meters. The fifth and final mountain is very close to the last one. If you are heading from the Snobby Shores mountain, all you need to do is head directly east to the mountain beside it. 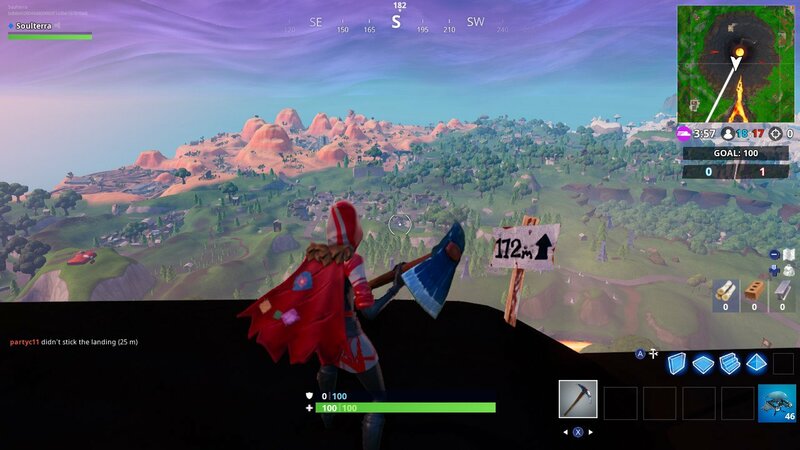 If you aren’t coming from that mountain, you’ll find this mountain is located just south of Pleasant Park. It is known for having a ramp up there that you can ride off of. To get up here, you will need to do the same as the last one. You can either use the Baller vehicle to grapple and boost your way up there or you can just build yourself a nice ramp to the top where the circle of thin trees is. Once you get up here, you will get a notification that you have completed this challenge. Like the last one, the sign says that you are at a height of 111 meters. Konami is celebrating 50 years of games with collections like the Castlevania Anniversary Collection, which now includes Kid Dracula, Castlevania II, Bloodlines, and Castlevania the Adventure. Which of these are must-play titles? Posted 1 day ago — By Charles Singletary Jr.
For this Fortnite weekly challenge, players must search for jigsaw puzzle pieces under bridges and in caves. We've got the best locations for finding these pieces so you can complete this challenge fast. The Fortnite week 8 challenges are now available in season 8. One of the big challenges this week has players dial the Durr Burger number on the big telephone. We've got everything you need to complete this weekly challenge. The Xbox 360 thrived during a generation where games were plentiful. Here's our list of the best Xbox 360 games of all time, including all game genres and even a few special indie hits. More than four years into its life span, Microsoft's latest console is finally coming into its own. From Cuphead to Halo 5, the best Xbox One games offer something for players of every type. Walmart reduced the prices on some new and popular Xbox One games. Kingdom Hearts 3 is at its lowest price yet, while Call of Duty: Black Ops 4 and Red Dead Redemption 2 get some stout discounts as well. Stream Elements and Stream Hatchet teamed up to produce the State of the Stream Q1 2019, a report that reveals a multitude of data. A few takeaways include Ninja not producing the best month of views, and Apex Legends' performance diving. Posted 17 hours ago — By Charles Singletary Jr.
Gaming desktops are powerful, but they tie you down to your desk. For those of us who prefer a more mobile experience, here are the best gaming laptops on the market, ranging from budget machines to maxed-out, wallet-emptying PCs. Zombies are a longtime media staple, from movies to literature to TV to video games. Plenty of zombie games are bland and boring, but a good number offer tangible reasons to care about the undead. These are the best zombie games. Calling it the most "ambitious cinematic shoot" the team has ever done, Naughty Dog revealed that the motion-capture performances for the main characters in The Last of Us Part II are finished. Posted 16 hours ago — By Charles Singletary Jr.
Civilization VI offers both series veterans and total newcomers a lot to chew on from the get-go. Here are some essential starting tips to help you master the game's many intricacies. The weekly vendor in Destiny 2: Forsaken always brings Exotic weapons and armor, some of the toughest loot to find in the game. Here's everything you need to know to track down Xur: Where he is, when he shows up, and what he's stocking. The Horde and Alliance are seeking new allies in their struggle for control of Azeroth. Whether you pledge your allegiance to the Horde or Alliance, we have a guide to help you unlock every allied race in Battle for Azeroth. Digital Trends helps readers keep tabs on the fast-paced world of tech with all the latest news, fun product reviews, insightful editorials, and one-of-a-kind sneak peeks. Digital Trends may earn a commission when you buy through links on our site. Copyright ©2019 Designtechnica Corporation. All rights reserved.